Budapest design studio POSITION Collective employs clever storage solutions, including a wardrobe rack, modular walls, and a storage-filled bed, in order to maximize functional space. 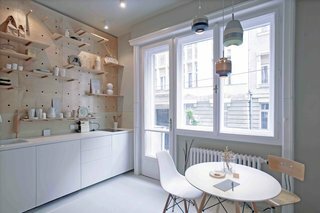 Though the 323-square-foot studio is now being leased out on a long-term basis, the clients had originally wanted to turn the small apartment into a stylish and memorable space for design-loving travelers visiting Budapest. 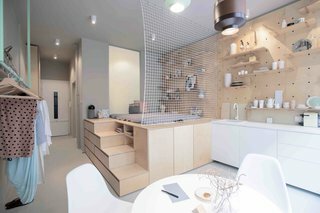 Because the apartment is so small, the owners needed to employ smart design solutions in order to make the most of the space. 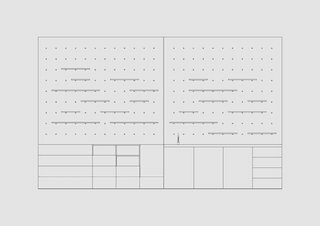 They hired Budapest design studio POSITION Collective to create a minimalist home that would meet all the needs of two visitors on a short-term stay in the city. Working with a tight budget and limited floor space, POSITION Collective kept costs low by minimizing renovation work and instead, investing in thoughtful furniture pieces and accessories. "Our intention was to create a light, highly customizable space that would offer maximum comfort for a short stay," says Bence Simonfalvi, the design studio's CEO. 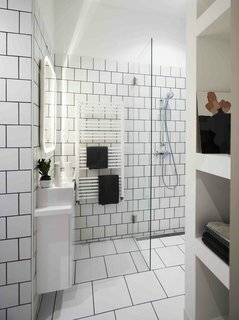 Structural walls that separated the bathroom from the living room eradicated the possibility of opening this area up, so the design team had to come up with other solutions in order to increase functionality without encroaching on precious floor space. 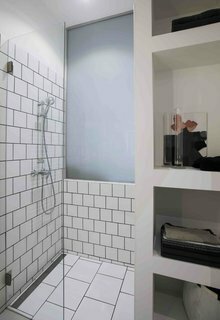 To bring more natural light into the bathroom, they installed a sandblasted glass window between the bathroom and living room. They created a modular plywood wall system with adjustable shelves that can accommodate books, dinnerware, candles, or home accessories. 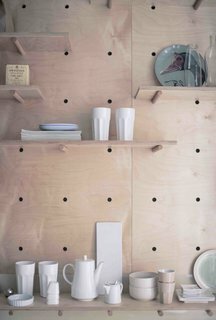 The ceramics and books double up as decor against the simple, light-colored plywood installation, which runs the length of one wall. 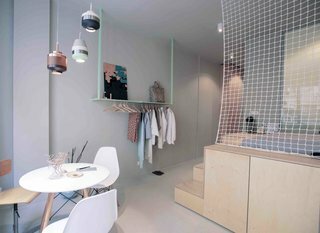 On the opposite side of this plywood wall is a green metal pipe-hanging rack, where guests can hang their clothes. At the heart of the small space is an elevated, plywood sleeping unit with multifunctional storage modules. 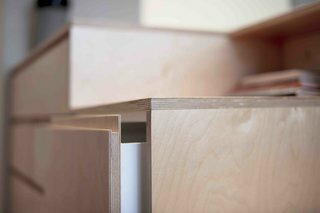 Following the Japanese style of mobile cabinetry, steps leading up from the floor to the mattress feature secret drawers and shelves. A see-through net helps divide the bedroom from the living space without making it feel too closed off. Perpendicular to the steps are discreet storage cabinets that can be used for a wardrobe, refrigerator, or washing machine. 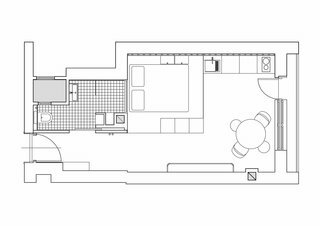 Attached to this central sleeping unit is a simple white kitchen with a sink and electrical hob. With its unique layout, clean lines, and charming pastel colors, this little home away from home certainly knows how to make the most of small space living. -Lighting design: 3F Project Ltd.
-Cabinet design: NA Ratio Faipari Kft.